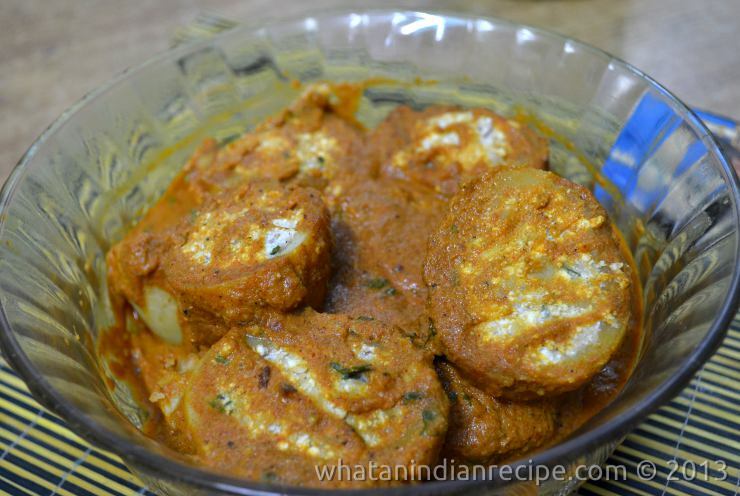 Potato stuiffed with a mix of paneer & cashew, and then cooked in a thick creamy gravy. Tastes best with naan/ roti/ pulao. Boil the potatoes in a pressure cooker with the skin on. Cut the potatoes in two halves and then carefully scoop the center of each halves. Then peel the skin off. Heat oil in a pan/kadhai and deep fry these scooped out potatoes till golden brown and drain them on tissue paper. Let it cool. Meanwhile mix the scooped centers of the potatoes along with paneer, and other ingredients for stuffing and mash them properly. Stuff the deep fried potatoes with the stuffing mix and keep aside. In the remaining oil after frying the potatoes , add the onion and ginger-garlic paste and saute for 2 minutes. Now add the kashmiri chilli powder, turmeric powder and garam masala powder and saute for another 2 minutes. To this add the tomato puree and cashew paste and cook for a minute. Add salt and required water to make a thick gravy. To this add the cream and coriander leaves and mix well. Finally add the stuffed potatoes to this and cook for another 2 minutes on low flame.